Quick. I needed an appetizer for the Super Bowl this weekend that was quick and easy and didn't require a lot of prep time. This was genius! What else can I say about them? (tooting my own horn, but that's what blogs are for). 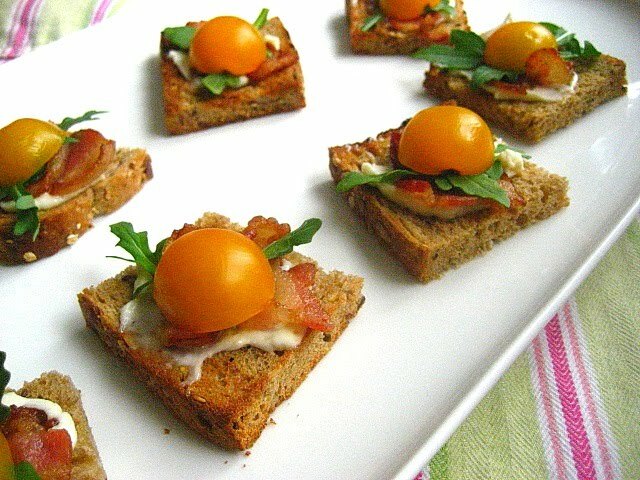 I was craving a BLT for lunch, and decided to make mini versions to serve as a first course for the game, and what guy doesn't LOVE bacon? Cut multi grain bread slices into quarters (so you have 4 pieces per slice) or with a cookie cutter into rounds. Toast the bread lightly if you like (I like). Use a half slice of bacon per each bread square or round. Cook bacon till crisp and drain on paper towels. ~ Swipe each toast w/ Hellman's mayo. 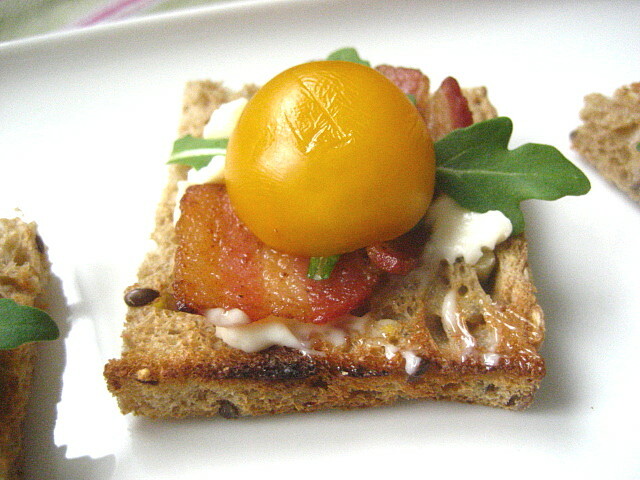 ~ Top with a half a slice of crisp bacon. 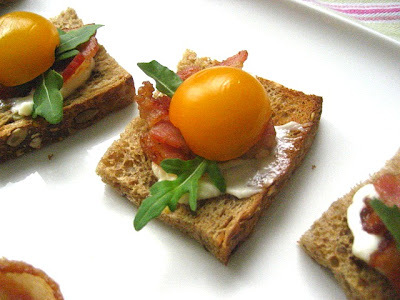 ~ Finish with a yellow cherry tomato half (so it looks like an egg yolk!). You can prepare them an hour before serving and keep at room temperature. They were devoured in seconds. These score for my favorite quick appetizer! Check out tomorrow's post for a great Super Bowl dessert. Who wouldn't love these babies. Love this idea! Would also work with those mini loaves of bread you can get in the deli section for tea sandwiches. YUMMY.... They look GREAT and are right up my alley. You are toooooo far away from us. That's the problem. We've been on a bacon sandwich kick. That is so simple it is genius! How come your cherry tomatoes are yellow? The one's we get here in Australia are red. I haven't seen yellow one's around here before. Good one Stacey! I love how the tomato looks like an egg yolk! You crack me up! yes, pure genius! will get lots of grunts of approval from your guests, bravo! I saw this yesterday and I picked up some bacon today, you're such a bad influence! Thanks for another great one. Borrowing shamelessly for Super Bowl party today. Do you toast the bread? It looks it in the pic. If so, can I do a couple hours in advance or will it get dry. Genius! Wish I had read this post prior to the Super Bowl, but will use this in the future. Yep, that is a good one! Nice balance of flavor and texture. I bet everyone at the party would enjoy this. Talk about being super cute. I'd eat these beauties for breakfast, lunch & dinner....even a midnight snack. I just discovered your site. Wow, these look easy and good!